Our quality isn't expensive.....it's Priceless! 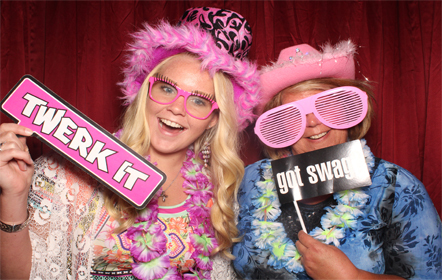 Weddings are our specialty and we work very hard to ensure your day is perfect! 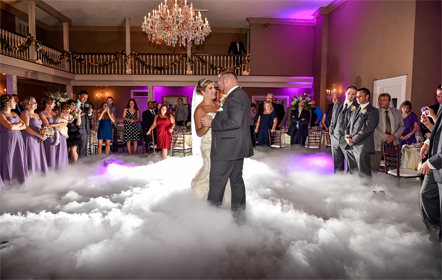 Our wedding packages are easy to choose from and all inclusive with all the basics like great sound, an amazing music selection, day of reception coordination, dance floor lighting, online planning / music services, and so much more! 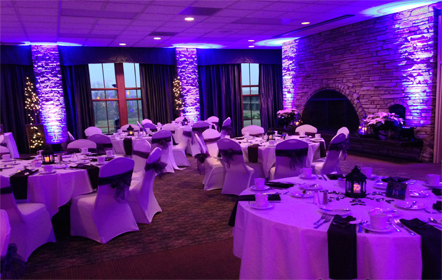 However we don't stop there, our additional options include all the specialty ambient accent up-lighting and table lighting that will make your wedding shine! 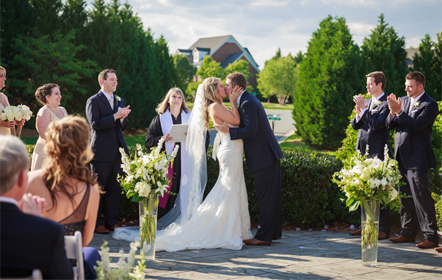 Make your consultation today and see why so many people say our wedding services are the best in the business. We can set up a second sound system, microphone and play music for your ceremony. 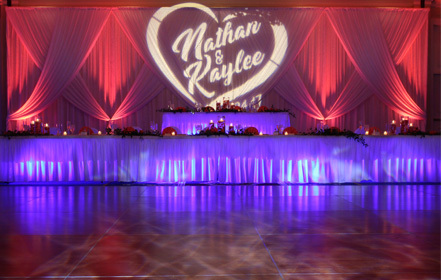 Custom designed personalized gobo projected from a state of the art projector. Washing a room with mood lights/up-lighting is great for creating an elegant atmosphere during dinner or adding energy to a room during dancing. These lights are placed around a room on the floor and positioned to shine up onto walls or columns to wash the room with color. The colors of the lights are totally up to you! We can dial in any shade of any color to match your decor. Includes: unlimited photos, 10 person photo both, attendant, table full of fun props, memory scrapbook, double photo strips (one for the guest and one for your memory scrap book), digital copies of all images taken at your wedding, personalized logo for each photo strip, a touch screen, external monitor and a secure online event gallery. 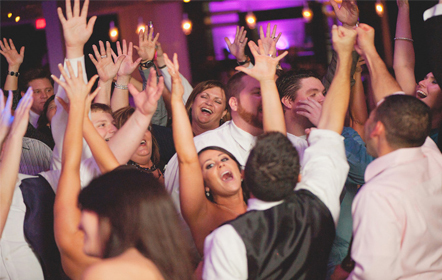 We’ll bring the party to life, while you enjoy a night on the dance floor. Amazing DJ - Highly Recommended - One thing I really loved is that he seemed to get the party going even during dinner. He interacted with guests and played songs and got people to sing along. People were on the floor all night, even people who swore they'd never dance.. The Dj ran the reception so I was able to really enjoy being a part of it all. He really kept people on the dance floor, and events moved quickly so that no one was ever bored. Everyone said that it was one of the best receptions they'd been to, and a lot of that is due to the great Dj! Mike played my wedding and the dancefloor was packed all night. He has a way of knowing exactly what your guests want to hear and playing it for them before they even ask. If you are going with a dj, he is your man. Casey was our DJ for the night! Wow! Casey was awesome! He kept the party going and got people on the dance floor. It was the best night ever. We had our guests complimenting on how wonderful Casey was! THANK YOU!